Benson,Bailey & Bella with me. I am committed and very passionate about all of my fur family, my hobby is Showing and also occasionally allowing my girls to have a litter. As it is just as important to care and love your Adult cats to make sure they are happy and healthy. My kittens have been proof of beautiful and healthy parents, with the traditional Ragdoll traits including; big BLUE eyes & purfect loving temperaments. 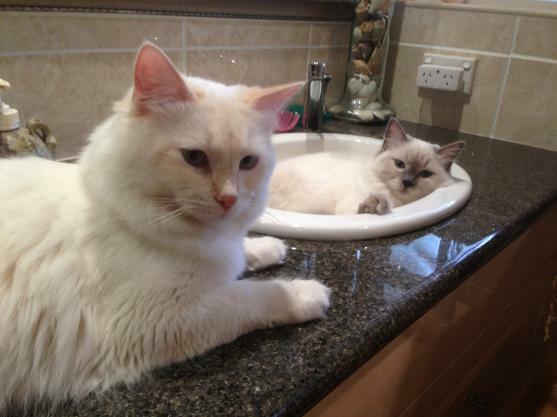 I am a devoted Ragdoll Lover registered with Cats NSW, all cats/kittens are DNA tested for HCM & PKD. We also qualified as a "Cattery Of Excellence" with Australian National Cat Alliance - ANCATS. Our kittens are raised in our home with mum. Which means they are raised around my husband and I and my entire family who visit weekly with their 4 children ranging from 6 to 16yrs, not to mention having our other pets which include our loving dogs who just loves all our cats. We do not have our pets locked away in confined cages. 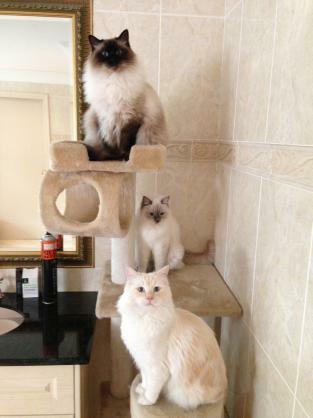 Our Ragdolls are STRICTLY indoor cats only. We breed for quality not quantity, so we may not have kittens all year round, but may know of a reputable Breeder who has. 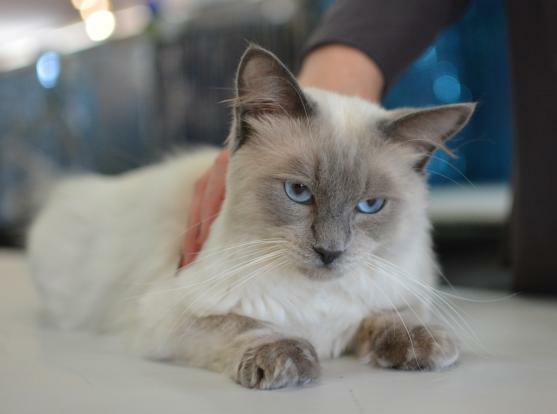 If you would like to enquire about our beautiful Ragdolls or would like to be put on our waiting list, please call - Rebekah 0417 672 024. 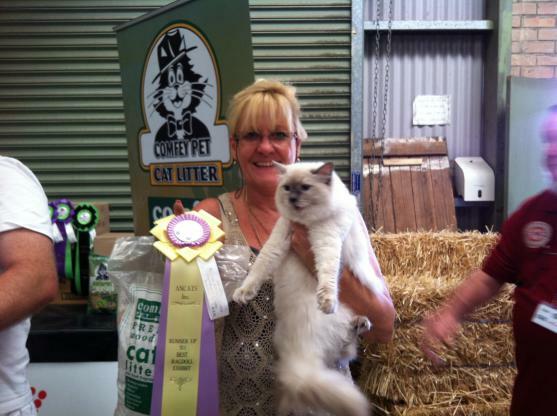 I have also been showing my cats and kittens since I started with my very first Ragdoll, have won Best Entire, Best Desexed, Best Kitten, Best Litter, Best of Breed, Best Bred Cat by Exhibitor,1st, 2nd,3rd ,4th & 5th Top 5 awards for Sydney Royal National Championships. All of our Kittens are delivered personally by me to your home to help settle them in and to continue their good behaviours and training, they come with a registered Pedigree registered papers, 3 vet checks, 1st vaccination, wormed, flea free, Desexed, Micro-chipped a Kitten Care pack with information, FREE Food and litter samples PLUS 6 weeks FREE Pet Insurance. Show Kittens - Price on Application. Breeding kittens - Not selling. We require a deposit to hold a kitten. Pet kittens require a $300 non refundable deposit. No kitten will be considered reserved until we receive a deposit. Our Kittens are not released to their new home until they are at least 12 weeks of age for boys and 14 weeks for girls (due to de-sexing at age 12 weeks and 1.5kg weight) and to ensure they are well adjusted and ready for their new family. We reserve the right to refuse sale to any person at any time even upon delivery. **Please Note if I do not have any kittens at the time of your enquiry, I do work very closely with another Breeder who may have kittens available, - so it's worth enquiring. Facebook: View videos ,pics & testimonials @ "AffinityRagdolls - community"